If we’re being honest, the 2017-18 Major League Baseball offseason has been drier than the Sahara. There’s been a major lack of the high profile transactions that baseball fans eagerly await as a way to bridge the gap between seasons. It’s resulted in a slow and boring winter for fans and more than a month without a post from yours truly, sorry about that. It’s not as if there are no stars available either. Pitchers and catchers report to Spring Training on February 13, just 23 days from now. Despite this, some of the biggest free agents of this winter are still unsigned. The most high profile free agent of the offseason is arguably RF JD Martinez, who is reportedly seeking a seven-year, $200 million deal. His only known suitor has been the Boston Red Sox, but the slugger remains unsigned. The Boston Herald reported yesterday that the team has offered Martinez five years for $125 million. Martinez has obviously not accepted (yet, at least). Based on that statement, it seems as if Martinez is the one prolonging negotiations, but it doesn’t matter whose fault it is. With the amount of moves made by arch-rival New York this offseason, the Red Sox cannot at all afford to be outclassed. They need to up their power game in a big way, as evidenced by the team finishing last in the league in homers last season. Martinez is their best available option to do so, but one side is going to have to budge before that happens. What’s also baffling is that the Kansas City three also remain unsigned. 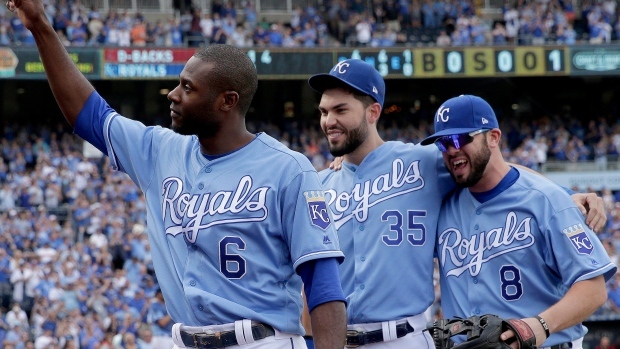 CF Lorenzo Cain, 1B Eric Hosmer and 3B Mike Moustakas all decided to move on from Kansas City (TSN). Mike Moustakas, Lorenzo Cain and Eric Hosmer all rejected qualifying offers from their longtime team the Royals and became free agents after last season ended. Hosmer was thought of as a major target for the Red Sox, but the team’s resigning of Mitch Moreland ended that. I haven’t been paying a whole lot of attention to the MLB Hot Stove but I honestly haven’t heard of any teams being interested in Moustakas or Cain, which is baffling seeing as Cain is one of the game’s best outfielders and Moustakas hit 38 home runs last season. Another slugging third baseman, Todd Frazier, has not found a home either. Formerly of the Yankees, it still appears that Frazier could be resigned, but there’s been speculation that the other New York team could be interested as well. The power hitter came to the Bronx from Chicago midway through last season and helped propel the Bombers to the ALCS. The Yankees would certainly be wise to resign him but it would take a lot, and the team’s payroll is certainly strained after the acquisition of Giancarlo Stanton. On the pitching side of things, 2015 NL Cy Young winner Jake Arrieta and multiple-time All-Star Yu Darvish are still out there. Like Martinez, Arrieta is searching for the $200 million range. His performances have declined since his phenomenal Cy Young campaign, but the 31-year-old is still guaranteed to have to have a big impact on whatever team that picks him up. Surprisingly, the Phillies are reportedly trying to land the right hander. Philadelphia OF Nick Williams has been training with his friend Arrieta in Texas this offseason, and states that Arrieta is interested in helping the rebuilding franchise get to the next level. 31-year-old Yu Darvish hasn’t spoken on the amount he’s looking for, but he could still command a good price. 2017 was a solid comeback season for the Osaka native and it saw him get sent to the Los Angeles Dodgers from his longtime Texas Rangers. He faltered in Game 7 of the Fall Classic against Houston, though it can be argued that he shouldn’t have been put in that situation to begin with. The Minnesota Twins have been in on Darvish all winter and owner Jim Pohlad recently confirmed his interest, per CBS Sports. Darvish could serve as a big time lift for a Twins team that turned a lot of heads in 2017 despite very little assets on paper. As Cactus and Grapefruit League play draws closer and closer, all of these players are still up for grabs. Will they get signed, or will they still be out there as the 2018 season begins? We can only wait and see. Check back with Home Run Daily for further developments!